Library book sales are wonderful, and the one here in Greenwich is especially well-stocked. I'm always coming across books that I've been wanting to read but forgot to request from the library or seek out specifically. The two I found last month were Perfection Salad (by Laura Shapiro) and Good Wives (by Laurel Thatcher Ulrich). 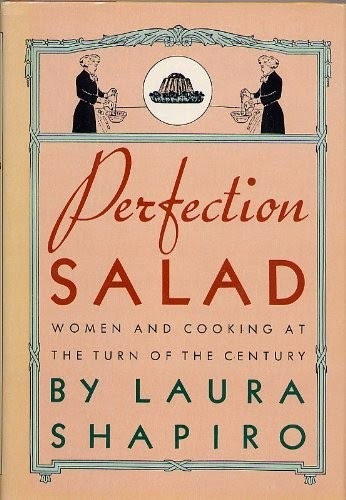 Perfection Salad examines the rise and fall of the domestic science movement - how it went from the general idea of women's housekeeping and cooking skills being important to family morality and health, to an organized system of schools and degree programs in cooking/chemistry/biology/etc., to the ignominious home ec class you were forced to sit through in eighth grade. WARNING: This post contains no talk of historical dress of any kind. You may, however, do like me and imagine all of the domestic scientists in the fashionable dress of their era(s). You can't fit the domestic scientists neatly into or outside of the feminist/"women's movement" of the late Victorian and early Edwardian (as is elegantly pointed out in the introduction, but amply illustrated in the following chapters). The earliest figures Shapiro presents were independent, unmarried women who supported themselves through writing and/or education, yet they promoted the sentimental ideal of selfless motherhood and perfect domesticity. Later women, the actual scientists and reformers, tended to assert that women were absolutely capable of understanding and practicing their principles of nutrition ... once they overcame their natural tendencies towards illogic and so on. Their ranks were increased by women (yes, 19th century women) who'd gotten higher-level degrees in chemistry and other sciences but were overlooked in favor of male applicants to teaching positions; they encouraged women not to rely on servants, but to proactively take their family's care into their own hands. But as much as domestic science provided a professional and public role for women, it was still firmly in the same sphere it had always been, and the word "dainty" was used repeatedly in various food descriptions to emphasize the sweet womanliness of it all. And there was a strong thread of maternalism towards poor/immigrant women who wanted to cook their own culture's foods or just fling some meat in a pan and slap it on the table - they just don't know any better, the poor dears. They want to use garlic. Because, you see, the food of the domestic science movement was a strange mixture of bland and bizarre. It began in Boston, where plain food was prized and enjoyment of eating was suspect, so much of the fare that the scientists promoted was influenced by that philosophy. It was of primary importance to treat cooking like chemistry, understand how different dishes in a meal interacted on digestion, and balance the eaters' nutritional intake exactly to prevent wastage - not to make things like pies, which seem to have been considered especially unhealthy, and - possibly more importantly - associated with rural women concentrating more on feeding lots of people than on giving farm workers the proper number of calories to work efficiently. But at the same time, many of the strange dishes I think of as quintessentially mid-20th century seem to have come out of this movement. 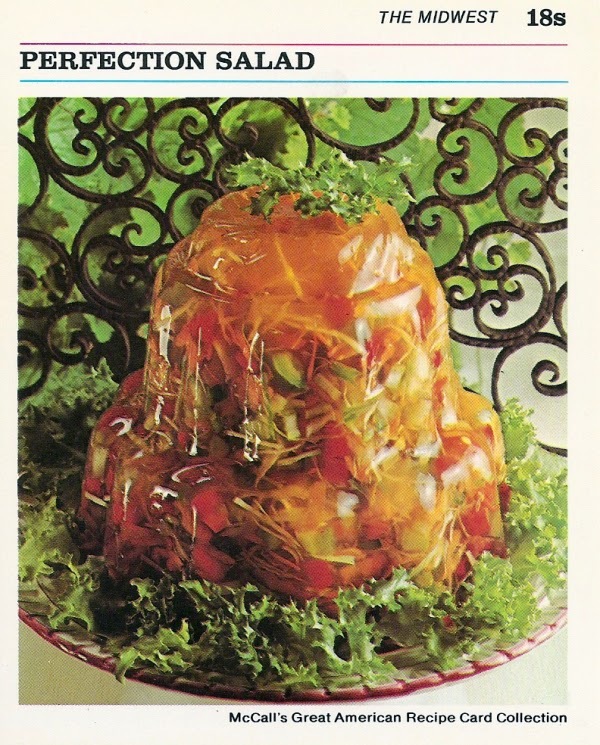 The Perfection Salad of the title, as well as other vegetable and meat salads embedded in gelatin, was heralded as beautiful and delicious, as were things like orange halves scooped out of their peels, turned into jelly, and put back in them. I didn't find it hard to understand why so many women were resistant to these principles. However, they were still enormously influential. For one thing, they promoted understanding the places of proteins, fats, and carbohydrates in the diet (vitamins were essentially unknown, although they did realize that there was some reason you needed to eat vegetables), and the notion of connecting calories eaten with calories burned by the body. They trained hundreds of women as professional cooks and housekeepers, and hundreds more as women who could efficiently take care of their own homes. Clearly some of their specific recipes lasted into the 1950s and '60s, and their general approach to recipe standardization certainly influenced modern cookbooks. Perhaps their most lasting effect came from their endorsement of pre-made foods. The domestic scientists and reformers were forced to accept that the ready-made food available at the time was vastly less tasty than home-made, but half the point of the movement was to impart standardization to food. Being able to ensure that every woman had the same loaf of bread in her home, the same piece of beef, the same scalloped potatoes was the perfect end result. Canned fruits and vegetables were untouched by human hands and thus totally clean, potentially even better than fresh. They also took up the new product Crisco because, as a manufactured product, it was always the same and never spoiled (and had no flavor). As a different kind of femininity rose in prominence after World War I, the movement and its ideals fell off sharply. Instead of dismissing the servant and taking the kitchen in hand, a woman was encouraged to hire a girl to do the cooking and cleaning so she could be a sweet little wife who could concentrate on her husband. Cooking started to involve more frozen, packaged foods, cans of soup, and makeshifts - "recipes" started to involve very few raw ingredients. The most amazing thing about the book is the mirror it holds up to our present situation - and I mean "mirror" in as close to a literal sense as I can get while still being figurative, because it's entirely backwards. Shapiro recognized this in the mid-1980s, when the book was published, but it's so much more true now. Food reformers/activists today campaign against homogeneous, mechanized food purveyors and in favor of imaginative, non-structured cooking. Cookbooks are intended to help people branch out and try new things, rather than pull people back to the proper path. Locavores' enthusiasm for farmers' markets and personal gardens matches the earlier enthusiasm for purchased canned foods. The only way it's not reversed is that both the domestic scientists and modern food reformers scrutinized the unhealthy additives of unscrupulous manufacturers (and that some of the concern over what other people are eating - especially if they're on SNAP or WIC - still retains a class-bound condescension). Perfection Salad isn't a fast read, but it's a good one. The domestic science movement is fascinating, and every other page brings something you have to quote to the person next to you. "The assumption that women were averse to meat - or ought to be - was widespread, and gave rise to a virtual epidemic of iron-deficiency anemia among adolescent girls, which lasted until after the turn of the century." "The Woman's Laboratory opened in 1876, ... and they trained dozens of women every year until 1884, when MIT agreed to incorporate women as regular students." It's a vastly different perspective on the era, and even though it has no relevance to fashion history, I loved it. The Housewives League here was instrumental in reforming the food industry, reducing pollutants in milk and cleaning up butchers and meat shops. Having read their reports, I can understand why homogenization would have been quite attractive. This sounds like a very interesting book-- well found!